Which taxes yield stable and reliable revenue? Which ones don't? Gavin R. Putland compiles the form guide. Local governments, for all their whining about the difficulty of funding their services, always get precisely as much revenue as they budget for. When drawing up their budgets for the coming financial year, they add up their rating bases according to the latest property valuations, and work out a set of “rates in the dollar” that will yield the amount of revenue that they want. And, lo and behold, they get near enough to that amount! Unfortunately our higher levels of government are not so sensible. To see how the various State and Federal revenue bases have performed since the introduction of the GST, I consulted ABS 5506.0 (Tables 1,10), picked out the undivided line items that yielded more $5 billion nationally in 2009-10, separated them into Federal and State categories, and plotted the revenue from each tax against time. The result appears below (where the colour codes in the legend are in the same order as in the graph proper). Of course the taxes in the graph were subject to changes in rates, thresholds and rules during the sample period. In the case of State/Territory taxes, there were different arrangements — and different changes of arrangements — in different jurisdictions. 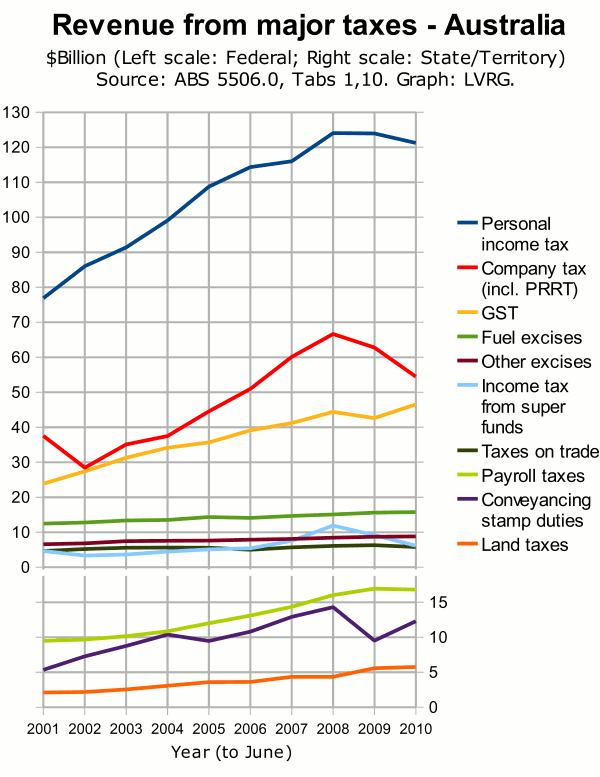 These caveats are weaknesses in the sense that the graph does not show the bases of the various taxes. But they are strengths in the sense that the grow shows how the taxes actually performed when legislated by real politicians under real political circumstances. One reliable performer is land tax. This is levied on site values, as are council rates in Queensland and New South Wales. So the municipal practice of “working backwards” from revenue targets to rates in the dollar is not the only reason why those targets are hit. Other steady performers include fuel excises and other excises, which raise more revenue than land tax in absolute terms, although less in proportion to the total budget at the corresponding level of government. The yield from taxes on trade (tariffs) was neither as high nor as steady as that from excises. Of the three biggest taxes in the graph, the most reliable is the GST, whose revenue yield dipped slightly in the year of the “GFC” but recovered in the following year. The other conspicuously reliable performer, though it pains me to say so, is payroll tax. Because payroll tax has an origin base, it is less efficient than a consumption tax, which as a destination base. Because payroll tax, when shifted upstream, bears down particularly on employment and wages, it is more regressive than a consumption tax, which does not discriminate against the labour component of “value added”. So payroll tax has serious faults. But volatility of revenue is apparently not one of them. Company tax, which shows the biggest fall in revenue on the graph (2007-8 to 2009-10) and the third-biggest (to 2001-2). Stamp duty is unreliable because its “base”, if I may call it that, is mostly unnecessary churning of the existing stock of accommodation. Even if you are an owner-occupant and are forced to relocate, you can install tenants at your old address and rent the new one, thus avoiding a dutiable change of title. If enough property owners do this, governments will be forced to abandon stamp duty in favour of some other impost that can't be so easily avoided. In the mean time, the opportunity to avoid stamp duty is there for the taking. The logical replacement for stamp duty is a broad-based land tax, which raises revenue from the same economic class as stamp duty — namely property owners — but raises it more reliably. If land tax causes a cash-flow difficulty, the tax liability can be deferred at a nominal interest rate until the property is next sold, and can be capped to (e.g.) some fraction of the real capital gain. The fiscal uncertainty caused by such deferments is minimal because deferment is not avoidance, and because only a fraction of owners defer. Revenue from company tax is volatile because a small fractional change in corporate revenue or expenses will produce a larger fractional change in the difference between the two — that difference being the tax base. Income tax from superannuation funds is similarly volatile because it is correlated with the profitability of companies in which the funds invest. Of course the volatility of company tax receipts would increase if the tax exempted normal profit but applied at a higher rate to the super-normal component of profit — as with the petroleum resource-rent tax (PRRT). So, while super-normal profit taxes score highly for equity and efficiency, their revenue yield should not be relied upon for recurrent expenses, but rather should be saved or invested in ways that yield benefits beyond the current economic cycle. Receipts from personal income tax slumped in the wake of the “GFC”, but not as much, in percentage terms or in absolute terms, as that from the other components of income tax. In total, income tax was not a stable revenue source. When it is said that income tax is an economic “auto-stabilizer”, what is allegedly being stabilized is the private sector: a slump in economic activity causes a revenue slump, which in turn is a fiscal stimulus. Thus the alleged stabilizing effect on the private sector is due to instability of public revenue. The reliability of State and Territory revenue would be greatly improved if conveyancing stamp duty were replaced by a broad-based land tax, and would not be impaired if payroll tax were replaced by a consumption tax or a broad-based land tax. The reliability of Federal revenue would be greatly improved if income tax in all its forms were replaced by land tax, or a consumption tax, or some combination of the two.